Although closed for a couple of weeks now, Andrew Laumann’s second solo show Corrupt Images ran from 1/2/15 – 1/22/15 at Terrault Contemporary in Baltimore’s Copycat building. Laumann’s recent paintings replicate phenomena that are often found on city streets along the walls of bridges, buildings, tunnels, and various structures of transportation where advertisers put up posters and graffiti is written. The exhibition consists of nine works, all framed, ranging in sizes from approximately 12″x16” to 3’x4’. The paintings are made by layering pasted sheets of colored paper with an adhesive and then tearing parts off in order to collapse those layers into textured compositions. These textures are difficult to capture with a camera, and straight-on installation images don’t quite do them justice. A few of the works are completely painted over with a semi-reflective silver wash, alluding to when city anti-graffiti efforts cover spray paint with rectangles of paint. Similar imagery is found not far from the front door of the gallery along the Guilford Ave bridge, just half a block away. It’s a good looking show; it’s hard not to like aesthetically. The texture, composition, and colors are all well-considered and controlled. The spacing of the paintings, the variation in sizes, and the arrangement create a pleasant experience when navigating the gallery space. Although the materials and the subtractive process of peeling away paper fall into the category of Painting, the work is almost photographic. For one, each surface seems flat until you get up close and see the texture. But also, the steps to production seem to be Witness, Absorb, and Recreate. Laumann is recreating, instead of photographing, an effect one would find on a walk through the city. But, why remake these rather than photograph it? The most obvious answer might be that re-creation offers control. Yet, there’s something incredibly unsettling about commodifying a phenomenon that accidentally happens on a city street. The spirit of the desired effect seems to get lost somewhere in the shift from street – to studio – to gallery. It’s not that every art show needs a press release, the problem here is that the work doesn’t stand strongly enough on its own. And even if there was a statement, I doubt it would add much. The work is straightforward and there doesn’t seem to be much to chew on. All that the work suggests is that Laumann is a product of his environment. By making and exhibiting abstract painting, you enter an entire history of Abstraction along with a history of artists making work that points to and is inspired by the street. 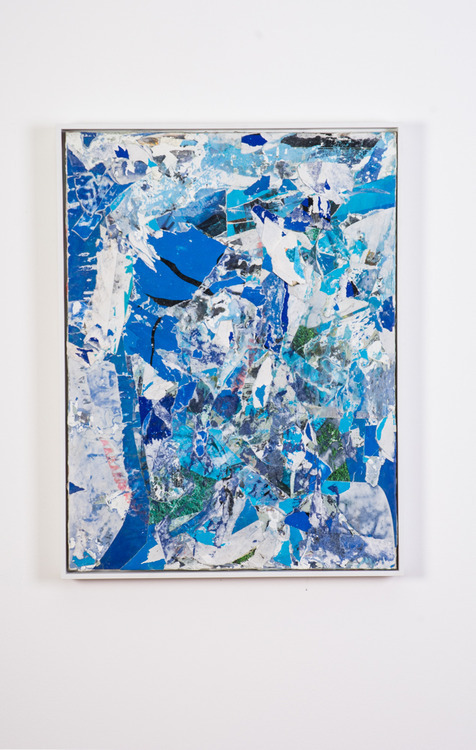 Looking at the work in this show its hard to not think of the work of Franz Kline, Jean-Michel Basquiat, Jacqueline Humphries, Laura Owens, or countless others. As a side note, I find this work a bit disappointing as a follow up to his 2012 exhibition, Hallowed Ground, at Penthouse Gallery. It’s important to note here that Laumann’s creative output is divided in two; he’s been the frontman and lead vocals of Dope Body, a punk noise band, since 2008. In Hallowed Ground, he had figured out how to harness the energy of a punk show into an art show. There was a painting made by slamming a skull-shaped object into a metal door, stacks of half-melted milk crates, an elegant photograph of a twisted chain-link fence and more in a multipurpose industrial gallery space that was four times the size of Terrault Contemporary. The work writhed in bravado and paralleled Laumann’s stage presence in Dope Body. There wasn’t a statement then, and there isn’t one now. The difference is that Hallowed Ground left an impression, a ringing in your ears. I can’t say the same for Corrupt Images. It is safer, cleaner, more put together but ultimately contained in the way that commercialism has learned to co-opt punk aesthetics and gestures. In the past, Laumann has shown he can maneuver around various mediums and artistic movements with machismo. Let’s hope he can combine his recent refinement with the energy of prior work as he builds his practice. 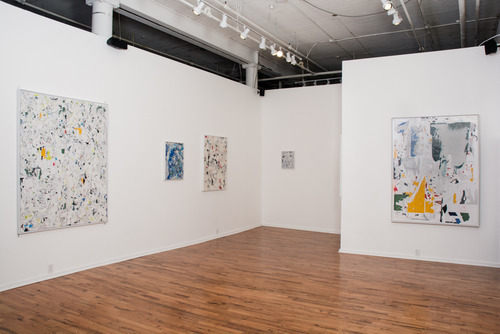 Exhibition Images by Kyle Tata, courtesy of Terrault Contemporary.